It’s not often that the building housing the theatre is as entertaining than the show on the stage but this is true of The Civic Theatre in Auckland. The Civic is one of the few atmospheric theatres in the world. The style is Arabian Nights meets the Raj. Elephants and horses, Buddhas and panthers, columns, minarets, domes and spires: it’s true Rococo style. Sculpted, ornate, covered in gold and totally over-the-top, but it works. 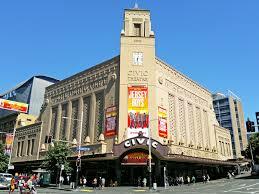 The Civic Theatre in Auckland. Home of musicals, concerts and the NZ International Film Festival. Bob Hope and Eleanor Roosevelt spoke to servicemen from the Civic’s main stage in World War 2 and over the years Priscilla, Mary Poppins, Jersey Boys, and Cats have performed under the glowing eyes of the 2 golden Abyssinian Panthers that sit on either side of the stage. In 2005 Sir Peter Jackson was given permission to film inside the main theatre, a rare privilege. If you watch the movie closely, you will see the theatre interior as King Kong breaks free of his chains and smashes his way out and onto the streets of New York. Ah, the magic of the movies! In the war years, The Civic was a home away from home for American servicemen in NZ. They came for the cabaret in the Wintergarden, a private area under the main theatre reserved for officers and their guests. Serving alcohol after 6pm was forbidden by law so it was smuggled into the theatre in the skirts of the ladies and hidden in tea-pots on the tables. The Wintergarden cabaret was extremely popular. Dancers’ costumes were created from whatever they could find in those war time years. They didn’t need much. Freda Stark, the most popular of them all, was naked apart from a g-string, some gold paint and a feather in her hair. Freda had to wash the paint off her body immediately after the show so that she wouldn’t die of lead poisoning. The main theatre has a soft ceiling with stars that twinkle and fall and clouds that gently float by. The sky can be programmed to different configurations: the stars in the night sky are exactly as they would have been in Auckland on 30 April 1929. It’s truly magical to sit under the stars before the curtain is raised, even more so if you spot one of the shooting stars! Thomas O’Brien commissioned the design of The Civic in 1929. He was a man with a great idea but terrible timing. The theatre opened as the Great Depression struck and within 2 years O’Brien was bankrupt. Somehow, thankfully, The Civic survived and in later years money was found for an expensive refurbishment and The Civic’s place as the home of musical theatre, concerts and film festivals was secured. Hopefully for many many years to come. When the theatre re-opened in 1999 after its refurbishment, it was even better than before. The restoration was painstaking in its authenticity and the restorers went to extraordinary lengths to update the interior without destroying any of its originality. Once a year during the Heritage Festival it’s possible to see the results of the extraordinary work. You can peek backstage to see the web of pulleys that move great slabs of scenery quickly and quietly, climb above the ceiling to see the 1000 twinkling fibre optic lights of the night sky and look under the main stage at the wizardry that transforms the stage into a thousand different scenes and made Mary Poppins fly. Hidden away in the maze of passageways and staircases there are private function rooms for special occasions (weddings are popular) and numerous bars decorated with tusks and mirrors and, yes, more gold. Starks Cafe and Bar (named after famous Freda) is adjacent to the foyer. It’s open during the day for coffee and photographs, and later at showtime it’s the place for a pre-show Fever of the Fleet cocktail (with gold leaf, naturally). Freda would have approved.